(female narrator) William Rowan was an eccentric and talented man who had many interests, including art, writing, nature, and science. But perhaps his greatest passion was birds. Originally from Switzerland, he immigrated to Canada in 1919 to pursue a career as a biologist. For Rowan, the Canadian wilderness presented a highly under-explored outdoor laboratory filled with biological discoveries waiting to be made. He was especially curious about bird migration: the annual journeys each spring and fall between breeding and wintering habitats. 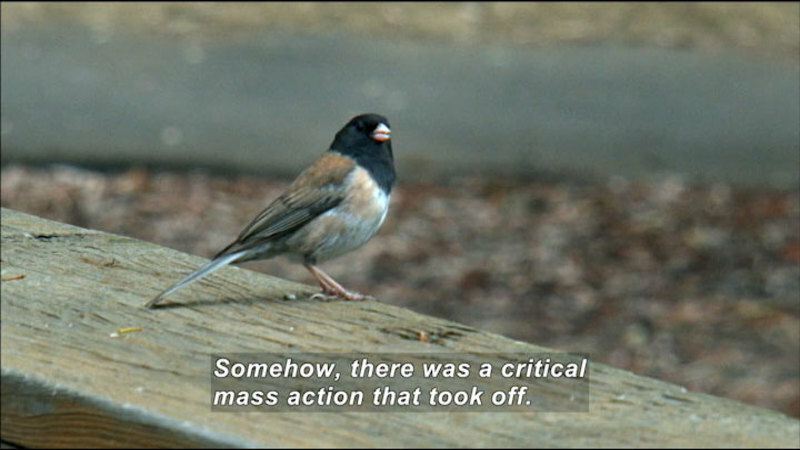 What was it that triggered birds to fly such great distances every year? How did they know when to go and when it was time to return? Leading theories of the time suggested that temperature and barometric pressure were the key environmental cues that birds used to calibrate the seasonal changes in their biology. Rowan saw things differently. In 1924, Rowan accepted an offer from the University of Alberta to establish a new zoology program. It was there that he hypothesized that changing day length, not temperature or pressure, was the key environmental factor that triggered bird migration and reproduction. Further, he reasoned that if changing day length in any way affected the migratory impulse, it must do so through the seasonal growing and shrinking of the gonads. Rowan was not the first biologist to consider the importance of photoperiod, but he would be the first to directly test it's role in animals. He devised an experiment involving a small population of captive birds that would be housed in two outdoor aviaries during the winter. The control group would be kept un-manipulated to observe and use for comparison with the experimental group. The two aviaries would be identical. However, the experimental cage would also have electric lights that would be left on into the winter nights to simulate the increasing length of days birds would experience in spring. 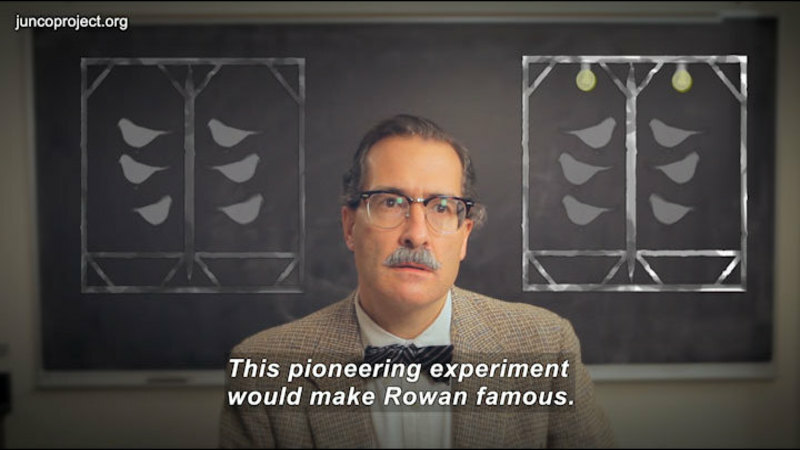 This pioneering experiment would make Rowan famous. 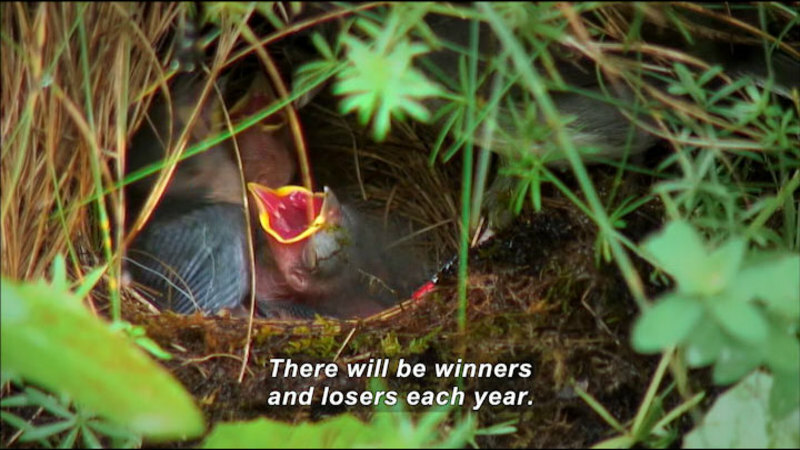 But it didn't come easy. University of Alberta president Henry Marshall Tory had very different ideas about science. For Tory, science belonged in the lab and only the lab. In the 1920s zoology was focused on lab studies of invertebrates, fish, and amphibians. Many regarded studying birds, especially in the field, as a foolish scientific pursuit. It's a waste of time. (narrator) Tory repeatedly discouraged Rowan and gave stern warnings to give up on his ornithological research. Fortunately for science, Rowan didn't listen, and he carried out his fieldwork in secrecy. As the nights got longer and the temperatures dropped, he made his day length experiment a reality, working in secrecy on his own property on nights and weekends. 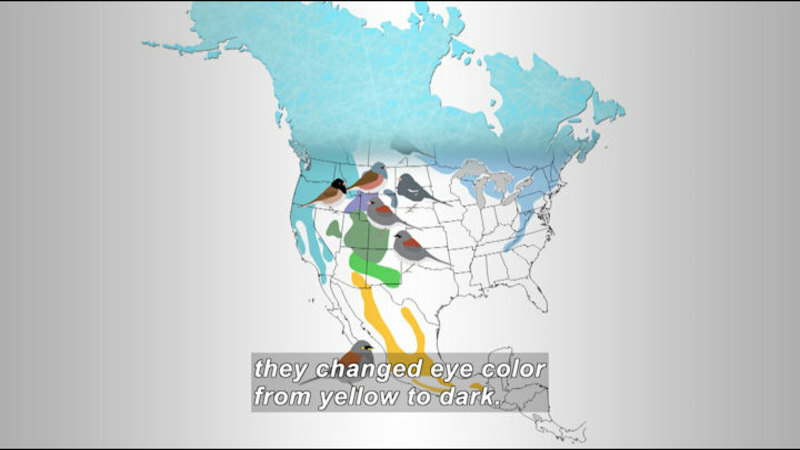 The bird he chose to work with was the dark-eyed junco, a common wintering songbird in Alberta that migrated northwards each spring. Juncos were an easy choice, as they were abundant in small flocks, easy to capture, and thrived in captivity. The experimental juncos received electric light well into the night for three months, with the duration of light increasing five minutes per day to simulate spring and early summer. 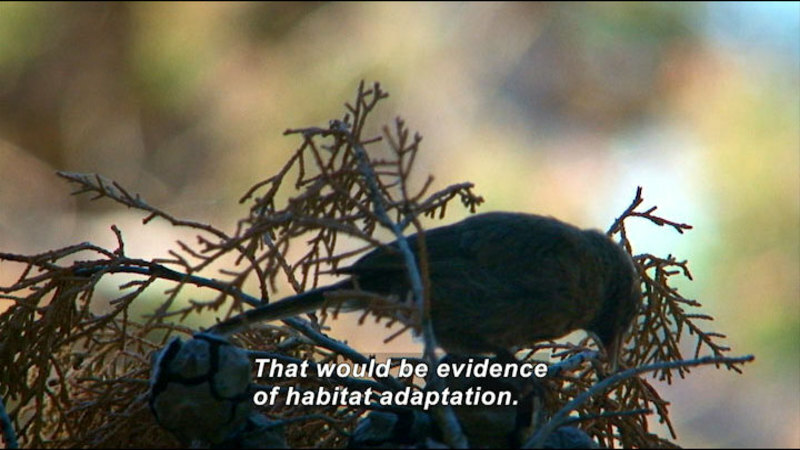 Except for the artificial lights, the birds lived in winter conditions. In fact, it was an especially cold winter, even by Canadian standards. Every two weeks, Rowan recorded behavioral observations and measured the size of individual birds' gonads. 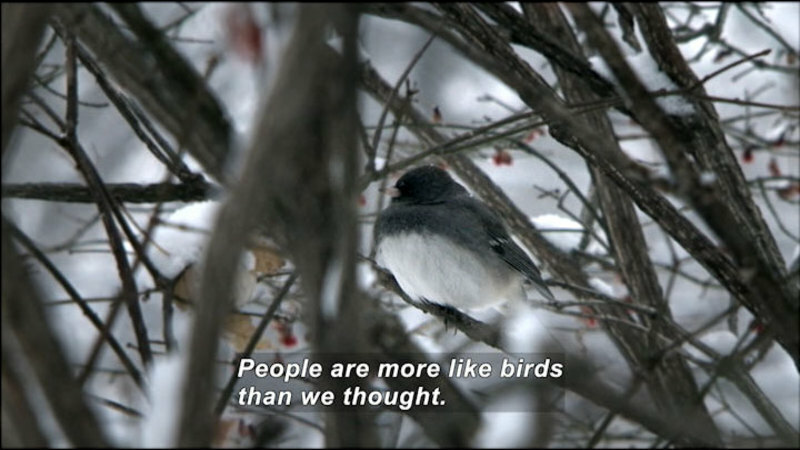 And just as Rowan had hypothesized, the increasing light caused the experimental juncos' gonads to increase in size. By the end of the study, they courted and sang as if it were spring. 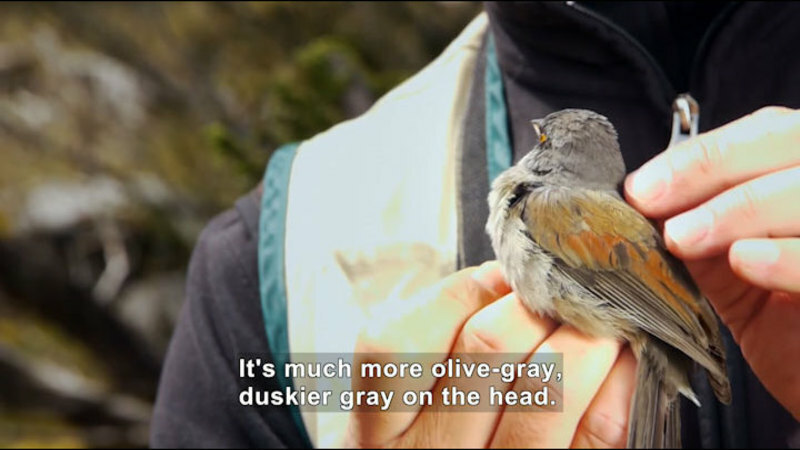 Scientist William Rowan is renowned for his research on the dark-eyed junco. Before Rowan, it was unknown what environmental cues animals used to time the seasonal changes in their biology. 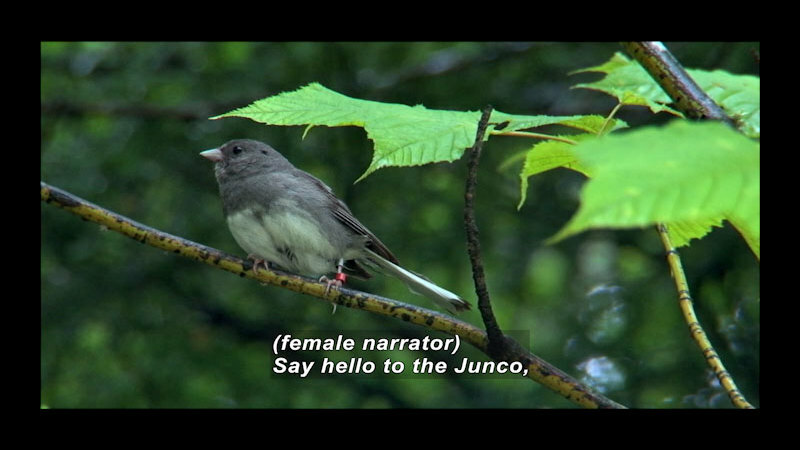 Through a groundbreaking experiment with the junco, Rowan discovered the physiological reaction of organisms to the length of day or night. 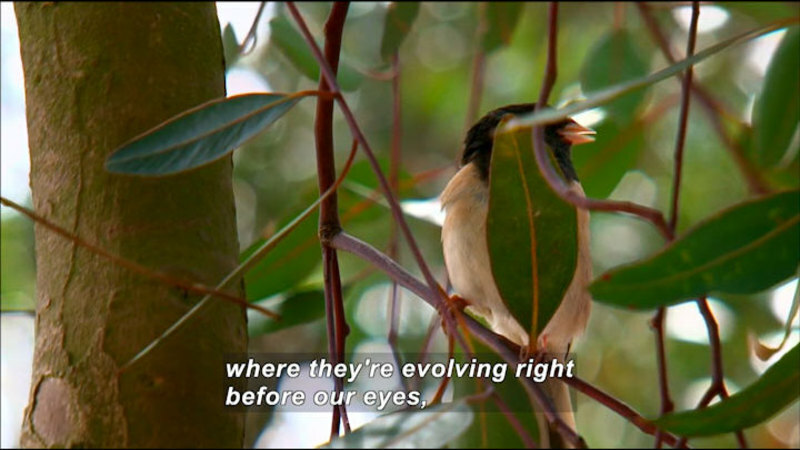 Shot as an historical re-enactment, this segment provides a glimpse into the history and human dimensions of scientific research and reveals one of the first studies that made juncos well-known to biologists. Part of Ordinary Extraordinary Junco (Chapter 1).